So yesterday morning I woke up and headed out to work. Crazy process right?! I kid! Anyway, I got ready headed out for my walk to the train and commute into work. Brrrrrr. Brrrrr. It was shock to head out that front door. Had to turn myself right around and go grab a jacket! Yesterday was the just the start of the layering season! I thought I was ready. But, shocker, I am NOT! I thought chilly evenings would be fun, this hot summer obviously got to my head! Since that moment, all I have thought about - I need more sweaters. Sweaters to layer with, sweaters to bundle up with, sweaters to transition into cold weather with! I need them all! I seriously need all these, especially those sweater dresses!!! Slouchy, cozy and perfect to wear now without tights, and later on over thick tights and booties. I could pick a color, bot would be absolutely perfect! And yes the Sequined collar number haunts me. I check everyday to see if it is back in stock!! 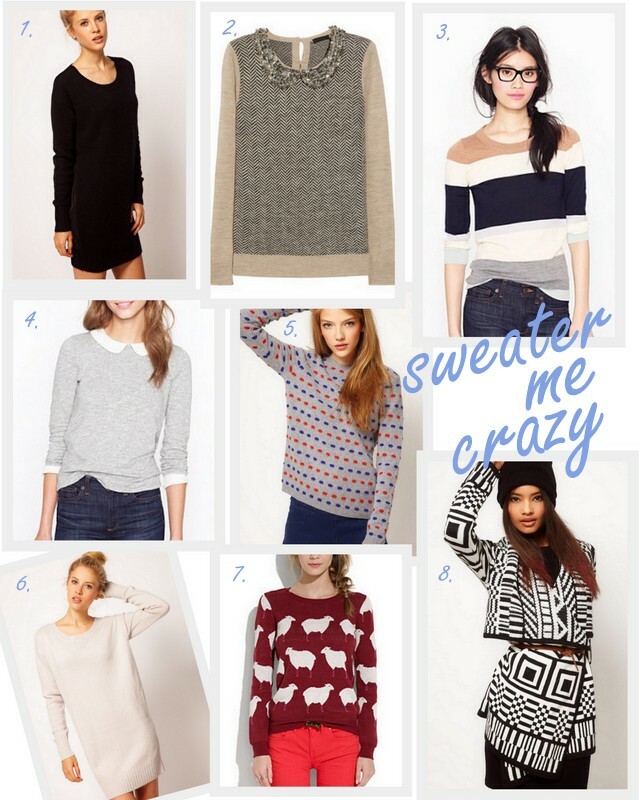 Are you sweater crazy yet? Oh girl, sweater #2 has been haunting my dreams. Seriously, it has. YES, I love sweater dresses so much! They are so easy, cute and comfortable to bundle up in on cold days, and even more perfect when layered with thick tights and a big cozy scarf! And I am so with you, I feel like there was no "in between" weather... that it went from being blazing hot to just BAM - cold sweater weather! Brrr. Love your choices here! Loving so many here! I think 2 and 3 are my favorite, though all are gorgeous! I just need so much stuff. That sequin-collar sweater is absolutely to DIE for. dying over that asos wrap! it's amazing! i'm pretty much in love with sweater dresses. i have two from ann taylor loft that are so comfy & cute! I am so with you on the sweater dress front!! That embellished colar one is just beautiful!